My nephew’s tearful good-bye to his Grandpa was almost more than I could bear. As I wrapped my arms around his burly frame, I remembered the little guy who’d spent summer days at our farm, playing in the creek and jumping on the trampoline with his cousins. His dad wasn’t in his life much, so his Grandpa was everything to him. Only my nephew knows the details of that most important, life-saving relationship, but on the night we stood in the dark next to his grandfather’s bed, I could feel it in his heavy heart and read it on his tear-stained face. “Honor him by living the way he lived,” I said. I wasn’t exactly sure what I meant by that, but in the weeks since our family came together during Dad’s final hours, I’m closer to seeing that it’s true: the best way to say good-bye to a hero is by living out the lessons he modeled in his life. Dad taught me, my siblings, my children, and the people who did life with him in a little Midwestern town so many things. Every person who knew him has a story and usually it involves something he showed them or told them about, or something he encouraged them to do or did for them. Dad wasn’t perfect, but he was humble and he was curious and he was generous. His best traits were his ability to see the good in other people and to appreciate the goodness of his simple life. Pay it forward. Dad appreciated the efforts of others and his greatest joy was to “do unto others as you would have them do unto you.” To live with generosity and gratitude is the best way we can honor the man who meant so much to us. Bloom where you are planted. Sure, Dad sometimes wished he could move to Florida and get away from Indiana winters, but we knew he’d always come back. He loved his hometown and often said it was the best place on earth to live. Work hard, but make time for play. For Dad, what others considered work brought him pure joy, whether it was mowing the lawn, fixing a squeaky door, painting the deck on his house, building a simple stool so grandkids could reach the sink, planting a garden, delivering the mail, painting a wall or shoveling the sidewalk, Dad took great pleasure in a job well-done. But, when the job was done, he turned to his hobbies, relishing them just as much. Sketching and painting, bowling, golf, even ice-skating with his kids (obviously that impressed me), Dad valued play as much as work. A place for everything and everything in its place. Dad’s tidy workshops were the envy of all who entered them. Everything was labeled, categorized, cleaned and boxed. He knew where every tool should go when he was finished with it. I’ll never forget the time he swept through the house with a waste basket, scooping up everything that wasn’t where it belonged and tossing it into the basket. He lived by this motto and expected the rest of us to comply. I can’t say that I’ve inherited Dad’s penchant for order, but I find I’m most productive when the space around me is tidy and free from clutter. Details and people matter. Dad loved telling stories about his hometown and the people in it. 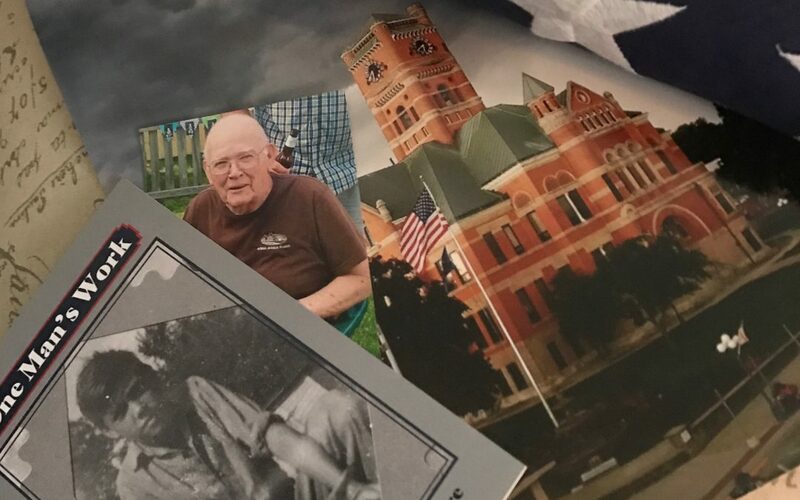 When we sat down to gather some of Dad’s stories into a book about growing up in a small town during The Great Depression, he pulled out photographs and newspaper clippings of people and events that shaped his community. He’d pick up a clipping and give the back story of the person receiving the honor, adding his own accolades and filling in the gaps. Dad had a razor-sharp memory and always it was important to him to get it right. There’s no way to quantify how the important people in our lives shape and change us. It’s only when we’re left with an empty space where they once walked and talked that we truly feel the impact of a life well-lived. One last thing I learned from watching Dad: heroes are human. They may save us, but eventually they’ll leave us. It’s then we’ll know that the best way to honor their life is to emulate the goodness we saw in them. Thank you Ingrid for your loving comments about your father. I think back so many times of my growing up years and the great Mom & Dad that I had. I grew up as the “baby” of a family of 7 kids and have many happy memories of those growing up years and the rich christian heritage that my parents set before us. Thank you, Phyllis. Seven kids! We had a house full with five. What a beautiful legacy. I count it as one of the many blessings in my life to have had their influence and love during my childhood. Miss them both and think of them often. Annie, they touched so many lives. I’m glad yours was one of them. Thank you for stopping by. Thank you for your usual….or even better than usual, insights in this message, Ingrid. Your memories of your dad reflect the best father-daughter relationship we can aim for. Blessings. Thanks, Shanda. I know I have a natural bias, but I agree — Dad and I had a beautiful relationship. Read this with a tear in my eye… I never knew your dad but I know how you adored him… and I understand about Hero dads! What a sweet tribute to him! Thank you, Kim. There were tears as I wrote it, too. I’m so glad to be privy to your words and to have known your Dad and all the charming “Wilson boys”. You captured his lessons well. I can only imagine how proud of his family he must have been, and am sure it gave him so much peace and happiness. Thank you, Lori. The Wilson boys were pretty special. Casey, Dad thought you were the best! Thank you for your kindness to him. Your Dad was a great guy. It was always fun to go over and hang out with Steve when your parents were home. Thanks, Dave. Lots of good memories there, I’m sure! Your mother and dad were super nice people. Glad that I got to know them both. Your dad was our mailcarrier for years. My sister and I bowled with your mother for several years. Kelly, it’s a blessing to hear from those who knew both Mom and Dad.